It’s a plan to revolutionize the way many see the city of Augusta. Private investors helping to transform the Garden City one innovator, and one downtown block at a time. From the outside, the Johnson Building and old Woolworth’s department store that sit on the corner of 8th and Broad Streets look like just your average buildings. But what’s about to transform on this block and inside of them is anything but. “Continually when we have the cyber conferences and technology conferences, people repeatedly say you need a destination downtown and you need live, work and play space for millenials, so we will have an entire block of that next year,” said Deke Copenhaver, Co-founder of the Augusta Innovation Zone. It’s called the Augusta Innovation Zone. “In the same sense that Google or Apple have innovative campuses that allow people to kind of have free reign to be ‘intrapreneurs’ is what they call it. Like I want to create things inside of my company, this is going to give people the opportunity to come and be surrounded by people who have similar aspirations,” said Tommy Wafford, Co-founder of the Augusta Innovation Zone. The first floor will be 17,000 square feet for co-working space – plus a test lab for companies like Snapchat and IBM. The rooftop will be transformed into a place to enjoy a new nightlife experience downtown. “You can put a stage here or what not, or put a bar and restaurant inside of here. So it can really be anything that we want it to,” said George Claussen, Co-founder of the Augusta Innovation Zone. The Johnson Building will have retail shops on the 1st floor and high end lofts on the 2nd. “Since we have both buildings, we’ll be able to create some really cool lighting that we’re working on and other visual effects. You’ll have a total alley way here on 8th street,” said John Cates, Co-founder of the Augusta Innovation Zone. 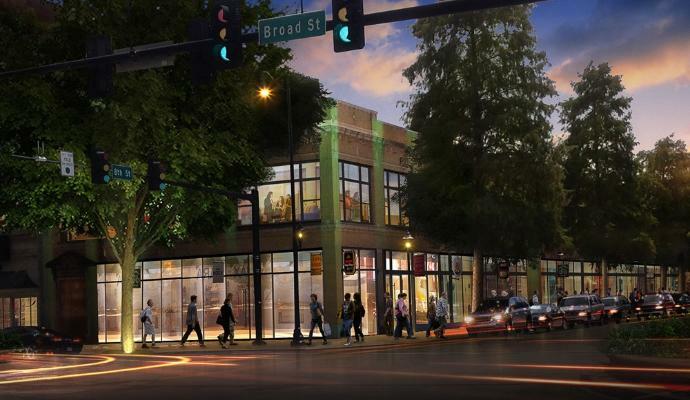 “There’s going to be a need for more restaurants, more retail, and to accommodates people working and living in this block,” said Copenhaver. “The Augusta Innovation Zone is a concept about being altruistic, being inclusive, being a way to bring in anybody’s idea and help blow that into something that’s really big and on a national scale,” said Tom Patterson, Co-founder of the Augusta Innovation Zone. The first phase is set to be complete Masters Week. The whole project is slated for completion towards the end of 2017.